Well... I did it. I completed my first year of law school. I am still too tired to really comprehend that fact but it is starting to sink in. This whole experience has been hard, exhausting, enlightening, entertaining and completely fulfilling. I have never been so proud of myself as I was upon completing my last exam and officially becoming a 2L. Now that a few days have passed, I have had time to sit back and really reflect on this year and all I have learned; inside the classroom and out. 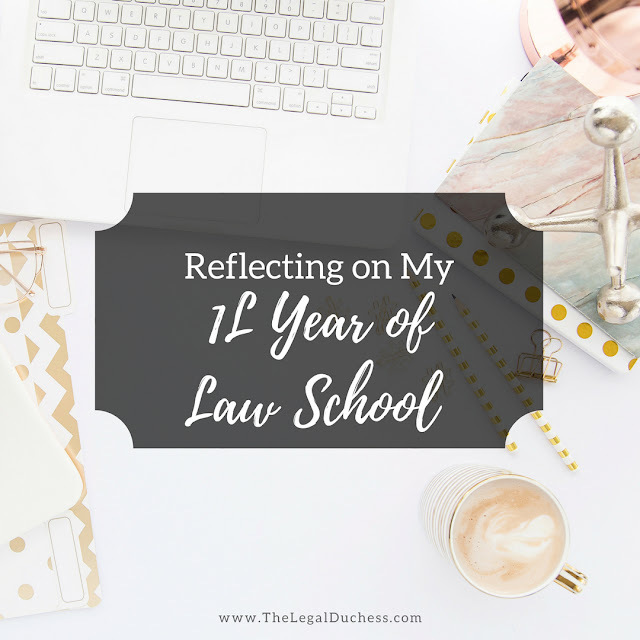 Here are my reflections on 1L year and tips for future 1L's. Cue the song from Aladdin because law school really is a whole new world. Sadly there is no magic carpet to guide you through your first year and you will have to rely on good ole' trial and error coupled with hard work to make it through. No matter how many blogs you read, older students you talk to and preparation you do, there is really no way to truly prepare yourself for the first year law school experience... it will try you but you will survive. Just like anything else, friends make things easier. Particularly in law school, it is great to make some good friends within the school who understand what you are going through. Your best friend, parents and significant others will try but no one can really understand this experience unless they have gone through it/are going through it. I cannot stress enough how great it was to have those law school besties to lean on when things got tough. I could not have gotten through it without breakfast dates, study sessions, group texts and the constant laughing thanks to my law schools friends. Law school forces people of extreme intelligence, strong work ethic, type a personality, competitive nature and a passion for the law into a few small classrooms. Most of us have always been "the smartest" prior to coming to law school and suddenly, everyone is like that. You have to put your ego on the backburner and not let it get to you. Everyone has strengths and weaknesses in law school; some excel in legal research and writing, others in oral arguments and some people just jive with criminal law. Find your niche and be proud of that and stop trying to be the best at everything- being your personal best is plenty good enough. This was a bit of an adjustment for me... but as soon as I stopped comparing myself to everyone else, life got a lot easier. There will be moments in the first year where it just seems like too much information, you will never be able to remember everything, you will never be able to comprehend adverse possession... let your doubts and concerns fuel you to work hard but also remember that you can do it. You are smart enough or you wouldn't have gotten in. You will be amazed by what your brain is able to comprehend, memorize and discuss by the end of the semester- you will be able to speak what seems like a whole new language. That's the light at the end of the tunnel. I am not the same person I was in August... I know more, I think differently and I have changed. The first weeks of law school are hard... everything is so different. But, it will get easier. You will get better at case briefing, you will learn to read faster, you will crush a few cold calls. First semester exams will seem daunting, second semester will seem conquerable. There were a lot of moments where I wondered if I would ever be able to finish reading before midnight or answer a cold call without sounding silly and I can proudly say, I did it and you can too. Law school will change you and that's okay. But you can't let it change who you are. You are becoming a lawyer- that will be your career, not your entire life. Neglecting relationships, mental and physical health, hobbies and non-legal life is not worth it in the long run. Law school will be a huge portion of your life but don't let it take over completely. Balance (or something in that vicinity) is key. I came into law school pretty open-minded as to an end goal- I wanted to be a lawyer and I wasn't picky as to what kind. I know other people who were dead set on becoming intellectual property lawyers or health compliance specialists. They put all their eggs in that basket and wouldn't accept internships outside of that field. I think they are doing themselves a disservice because you never know where you are going to end up and you never know if you might fall in love with a career path you never saw in your future. Stay open-minded and let life take you where it takes you. Life is going to happen, you are going to miss a class or forget to read or heaven forbid, fail a class. It's not the end of the world. Life will go on and it does not mean you will not become a lawyer or be a good lawyer. Dwelling on failures will do you no good. Take it from someone who had a few hiccups in the first year.... life goes on and a few months later those things just don't matter anymore. Law school is a great time to step outside of your comfort zone a bit. Join clubs, go to events you normally wouldn't, network... this is your last step before the professional world so take advantage of what it has to offer. I would say take chances but I don't think that's accurate- take advantage of opportunities. You never know where they may lead and how it may impact your life and your legal career. Law school is really hard but it is manageable. I struggled, I questioned myself, I cried a lot... but I made it. I completed my first year and I am 1/3 a lawyer. I am no genius and I am not the hardest worker in the world. I am newly married, a new homeowner and a dog mom x3. I spent a bit too much time watching Netflix, drinking wine and blogging. Despite all of that, I did it and I succeeded. You can too, I promise. Law school is hard but if this is the path you are meant to be on, it is so worth it. My first year is an experience I will never forget and I am so glad I blogged my way through it and can look back on these times. Thank you to everyone who has been along for the ride- the sweet comments and emails I get just make my day. This blog is not slowing down anytime soon. I have a big summer full of an internship at my local criminal prosecutor's office, a few trips, lots more DIY's and cooking and just sharing my ordinary life with those who find it worth reading. Thank you to everyone who reads and follows along with "The Legal Duchess:. Thanks for all of this! I've been binging your posts...I start law school in a month and a half! You are welcome!!! Best of luck in your 1L year!